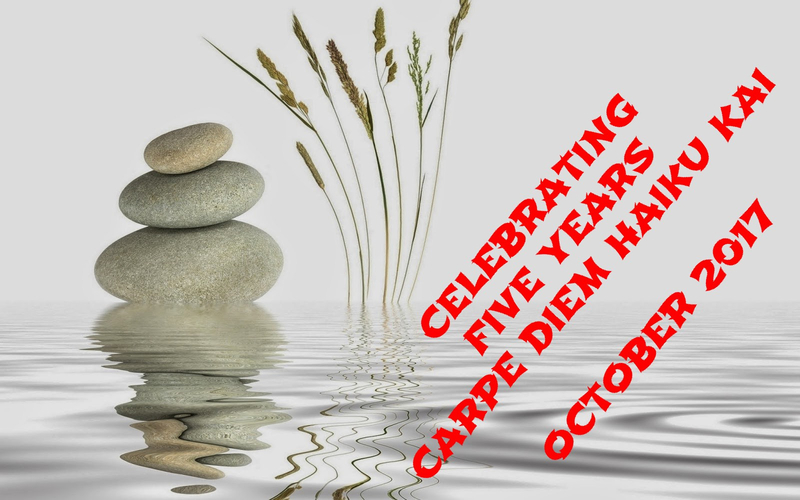 Five years ago I started with Carpe Diem an experiment to inspire the world through daily themes to create haiku. If any one had told me that Carpe Diem would be still alive five years later I would have laughed ... I really hadn't thought to be here alive and kicking. I am grateful that you, my dear Haijin, have made this all possible. Carpe Diem Haiku Kai has become a great success all thanks to you all. It makes me proud, but more ... it makes me humble. Who am I that I may do this? Who am I to be your host and mentor? Thank you all for this wonderful journey and I hope you all will continue to go with me on this journey. 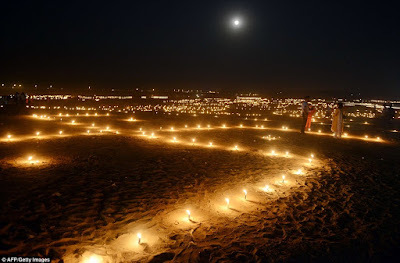 This month we celebrate our first luster, our fifth anniversary, and I think we will have a beautiful festive month. I have chosen for beautiful music and themes / prompts from our rich history here at CDHK. So this month will be a trip along memory-lane, except the musical prompts those are all new and I am happy that I had the opportunity to share this music with you all. This month we will have no weekend-meditations, but the weekends will be for the music. This Sunday our first musical prompt is titled "borealis" and is composed by a young composer Peter Crowley. He has composed wonderful music and for sure it's worth to visit and listen to his music on his You Tube Channel. Listen to his music. It's really awesome and I hope it will be a source of inspiration for you. Because of lack of time, I am on the nightshift, I have chosen a tanka from my archives inspired on Borealis. And now it is up to you my dear haijin, visitors and travelers. I am looking forward to this anniversary month and I hope you all do too. This episode is open for your submissions tonight at 7:00 PM (CET) and will remain open until October 7th at noon (CET). I will try to publish our new episode, perfume, later on. For now ... have fun! !! Open for your submissions next Sunday October 1st at 7:00 PM (CET) !! 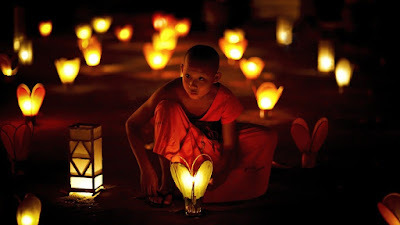 Welcome at the 4th weekend-meditation of this month. Next month these weekend-meditations will be temporarely on hold, because of our first luster. This weekend I love to challenge you to create a so called "soliloquy no renga" or solo-renga. It's a renga created by one poet instead of multiple poets, but it is also fun to create it. A "soliloquy no renga" counts a minimum of 6 stanza and a maximum of 12 stanza. This renga form is the same like a normal renga, so you have to create the stanza through association on scenes and images. More about the "soliloquy no renga" you can find HERE. I am looking forward to your "soliloquy no renga" in response of this weekend-meditation. This weekend-meditation is open for your submissions next Sunday October 1st at 7:00 PM (CET) and will remain open until October 8th at noon (CET). This episode of CD Imagination is Now Open for your submissions and will remain open until October 4th at noon (CET ). I will try to publish our new weekend-meditation later on. For now. .. have fun! PS. Now Online our new CDHK prompt-list for October. You can find it above in the menu. Welcome at a new episode of our "Imagination Without Limits" month here at our Haiku Kai. One image says more than Thousand words and that's what we are "proving" here this month. We only have images for our inspiration and sometimes a little bit background. Today's CD Imagination I have titled "courtyard blues" ... that was the feeling I got as I saw this image for the first time. 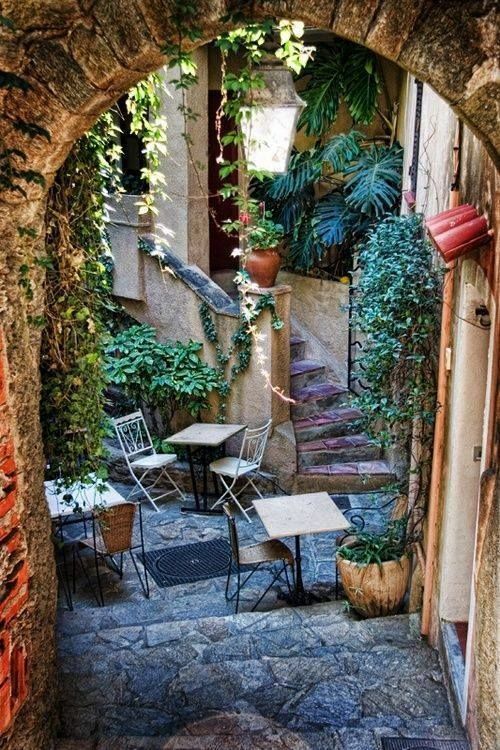 I found it on Tumblr and it is taken somewhere in the Provence (France). I couldn't retrieve the photographer of this photo so if you are or know the photographer, please let me know. A short episode today, because I am on the nightshift and therefore don't have enough time to create this episode. That also means today no haiku or tanka by myself. By the way: I have published our new prompt-list for October 2017, the month in which we will celebrate our fifth anniversary. You can find this new list above in the menu or by clicking HERE. A preview of our new CD Imagination you can find on our CDHK Tumblr. This episode is open for your submissions tonight around 7:00 PM (CET) and will remain open until October 3rd at noon (CEDT). Have fun! I love to read. 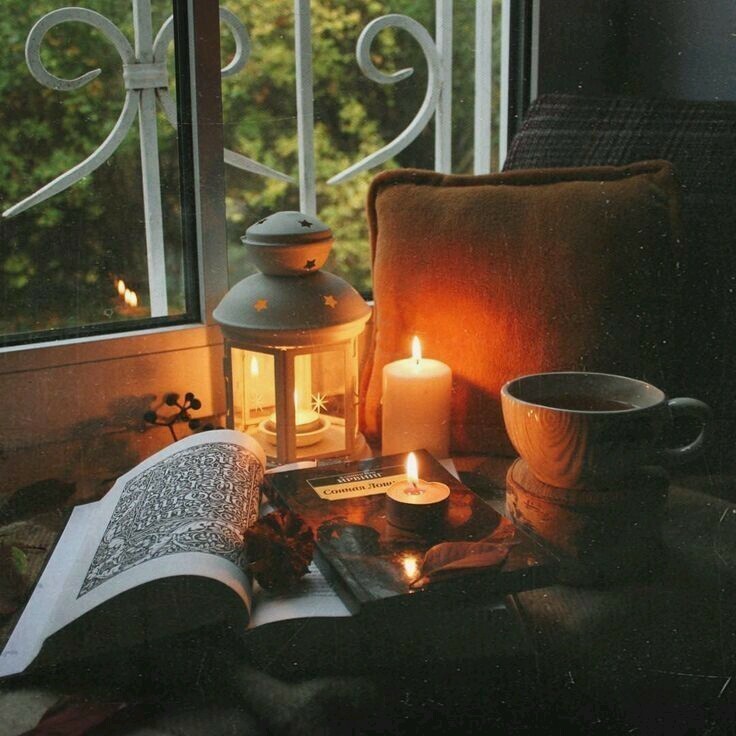 Cuddle up on the sofa and reading a book. Of course not only poetry, but also novels. But I also love to "read" books full of art or photos. Just looking at those wonderful photos gives me already the feeling of being there. This is why I created this month, because an image tells us more than thousand words can do. Do you know that feeling? I surely do. Today's CD Imagination is an example of such feeling. I have found this photo on Tumblr, to be precise on the poetbf tumblr. A wonderful tumblr full of gorgeous photos, images and art-work. This photo had no title, but I thought immediately of the pleasure of reading, so that became the title of this episode "The Pleasure of Reading". Here is my response on this beautiful scene, this beautiful photo. By the way I don't know the name of the photographer, so if you are the photographer or you know who the photographer is? Please let me know. This CD Imagination is open for your submissions tonight around 7:00 PM (CET) and will remain open until October 2nd at noon (CET). A preview of our new CD Imagination you can find on our CDHK Tumblr. Have fun! I hope you all have had a wonderful weekend full of inspiration. I am on the nightshift, so this will become (again) a short episode I think, but ... well we will see. A while ago I published a special episode about the first prompt of CDHK back in 2012, that episode had a nice logo I think, but I thought I would use the photo (without text) someday as a prompt. Well that's going to happen today. I have "removed" the text and then only the photo stays. 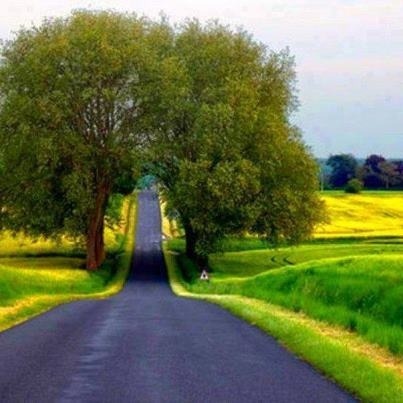 I found that image somewhere on Pinterest and it's title came immediately ... "winding road". Why "winding road"? Well ... as I started with CDHK back in 2012 I was on a winding road, because it was a "step into the dark". I had never created a website as Carpe Diem. I don't have IT knowledge enough to create a website, but ... I was lucky to find "blogger" the webdesigner-tool of Google, an easy to use tool to create a nice website. As I was preparing this episode a wellknown song of The Beatles came also in mind. I love to share that song here too, maybe to give you something more to become inspired or just for fun. A wonderful song I would say, a song that will inspire you a little bit more I think. Just enjoy the music and maybe ... it helps you to create your haiku, tanka or other Japanese poetry form. This episode is open for your submissions tonight at 6:00 PM (CET) and will remain open until October 1st at noon (CET). I will try to publish our new episode later on. A preview of our next CD Imagination you can find on our CDHK Tumblr. !! Open for your submissions next Sunday September 24th at 7:00 PM (CET) !! Time flies when you have fun, or a busy week. I had a very busy week, but I also had a lot of fun, not only private, but also at work. My work isn't possible without fun. As an oncology nurse I work with patients that are very ill, they all have a kind of cancer and are treated for it. There is always sadness, but we also have a lot of fun with each other. It's amazing how cancer patients are coping with their illness and their life ... they are all very strong. 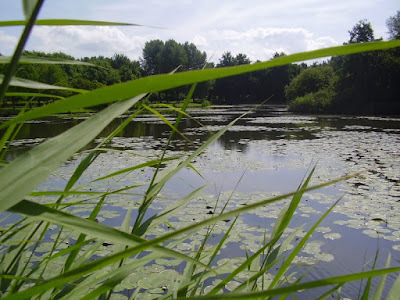 This weekend-meditation I love to challenge you again to create a Troiku. This week I love to challenge you with that haiku by Basho which I shared in one of the Wandering Spirit episodes of last week. Or to make it easier, you can also choose the following haiku to use written by myself. And if you have fun with creating Troiku, than please feel free to create a Troiku with both of these haiku. More about Troiku you can find in the menu, first there is an explanation of the form and second you can find a CDHK e-book "Flamingo Clouds" in the menu full of gorgeous Troiku. Well ... have a great weekend. This episode is open for your submissions next Sunday September 24th at 7:00 PM (CET) and it will remain open until October 1st at noon. I will publish our new episode around that same time. A preview of our new CD Imagination is now available at our CDHK Tumblr. First I have to apologize, because I forgot to post the preview of this episode on our Tumblr, but well sometimes that can happen. Today I have a wonderful image for your inspiration. I titled it "creating beauty" and it's a real beauty ... I think in this image you can find "fragile beauty" and "movement" ..
A (very) short episode this time, because I had a very busy day and I am a bit tired, but of course I cannot leave you without inspiration. This episode is NOW OPEN for your submissions and will remain open until September 27th at noon (CET). I will try to publish our new "weekend-meditation" later on. For now ... be inspired! This time I don't have a lot of time, so I only will give you our new image for this new episode of "Imagination Without Limits". A whole month full of beautiful images for your inspiration. The image for today I found on Tumblr, but I couldn't retrieve the owner of this image. So if you are the owner or you know the owner, please let me know. Look at this image. This is how I would like to bake my daily bread, but well ... I am a modern guy, with a passion for times gone, I buy my daily bread at supermarket. 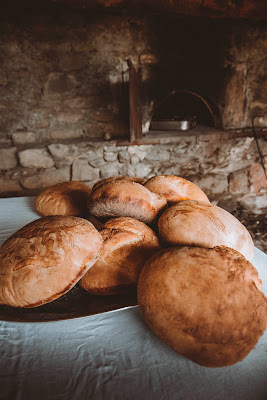 No nostalgia ... but what a joy it would be to make my own bread in the ancient way. Hm ... not as strong as I had hoped, but in a way I like the scene painted in this "experimental" haiku. This episode is open for your submissions tonight at 7:00 PM (CET) and will remain open until September 26th at noon (CET). You can find our new CD Imagination preview at our CDHK tumblr. Have fun! Welcome at a new episode in our "Imagination Without Limits". Today I have a beautiful image to inspire you. 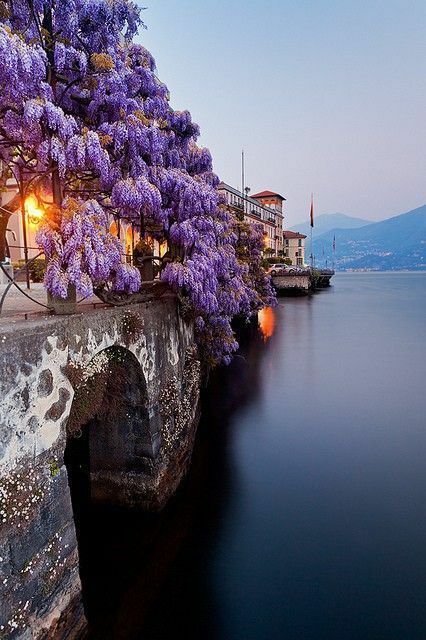 It was found on the Tumblr BonitaVista (which means beautiful vistas) and, after a long search on the Internet, I found the photographer who made this beautiful photo at the "Lake Como in Italy", it is titled "Wisteria Blues" (instead of "Wisteria Blossoms", as I had called it). This beautiful photo is made by Jonathan Reid and I hope it will inspire you. Take your time to connect with the scene, Lake Como Italy, and create your haiku, tanka or other Japanese poetry form. Well ... I hope you can find your inspiration, awaken your muse and share your Japanese poetyr inspired on "Wisteria Blues" with us all. The 2nd Annual Haiku For Change Event is NOW OPEN for your entries. More about this event you can find HERE. You are invited to participate in this event. Kichirou had made us breakfast and after morning tea he introduced me to Kikaku, one of Basho's apprentices and close friend. Kikaku was a handsome man with a bright smile and an open mind. As I let him read a few of my haiku he was excited. I blushed. "Thank you, but those are just the first haiku I ever created. 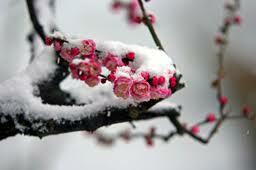 I just wrote them from my heart, without knowing the rules of writing haiku", I said. "Kichirou, you have never told me that you have such a gifted, such a talented brother. His haiku are amazing". "I didn't told you about him Kikaku, because I hadn't met him before yesterday. I knew I had a brother, we have the same father, but I didn't know when I would meet him. We ran into eachother yesterday while we were visiting our mothers graves", Kichirou said. "Praise the gods", Kikaku laughed. "It's a great day. You my friend have found your brother". We enjoyed the morning. Kikaku was a nice guy to have around. He told us about his life and how he met Basho, his sensei and friend. "I love Basho", he said. "But not as in a love relation, but as my friend. I love him for his friendship and his work as a haiku master and renga master. You have to meet him Yozakura and show him your haiku". "I would love to meet him", I said. "And let him read my haiku. He is the goal of my journey to Edo, but I am afraid that he will be disappointed as he reads my haiku". Kikaku laughed. "Don't worry about that. He will praise you for the beauty of your haiku Yozakura. Basho once said to me: "Kikaku now you know the rules of writing haiku ... forget them immediately. Look at the pine as it is a pine. Write from the heart and not from the mind or by using my education. Be your own master. You can do it Kikaku". Yes Yozakura that's what he said. So don't worry he will surely praise your haiku". I was astonished. This ... Basho, that famous haiku master, saw a master in every apprentice of him. In every haiku poet! "I would love to meet him". "Later this afternoon I will be back at Kichirou's home and than we will visit him in his "Basho-hut". He will be glad to meet you Yozakura. I even think he will be giving you some points to work with to make your haiku better and more beautiful. I see you later today". With that said Kikaku embraced us and left. "I am so excited my brother. I don't think I can eat or drink. Finally I will meet Basho", I said. After lunch Kichirou and I walked into the city. "Do you think we can visit the spot were dad's grocery once was?" I asked. "Yes we can visit it". A while later we stood at the spot were my father once had his grocery. It was now an empty spot were the people of Edo had created a beautiful garden in honor of all those Edo-people who died in the Great Fire. It was really a wonderful garden were all kinds of blossoming trees and bushes were planted. there was a nice pond in which Lotuses floated on the surface and Koi-carps were swimming around. 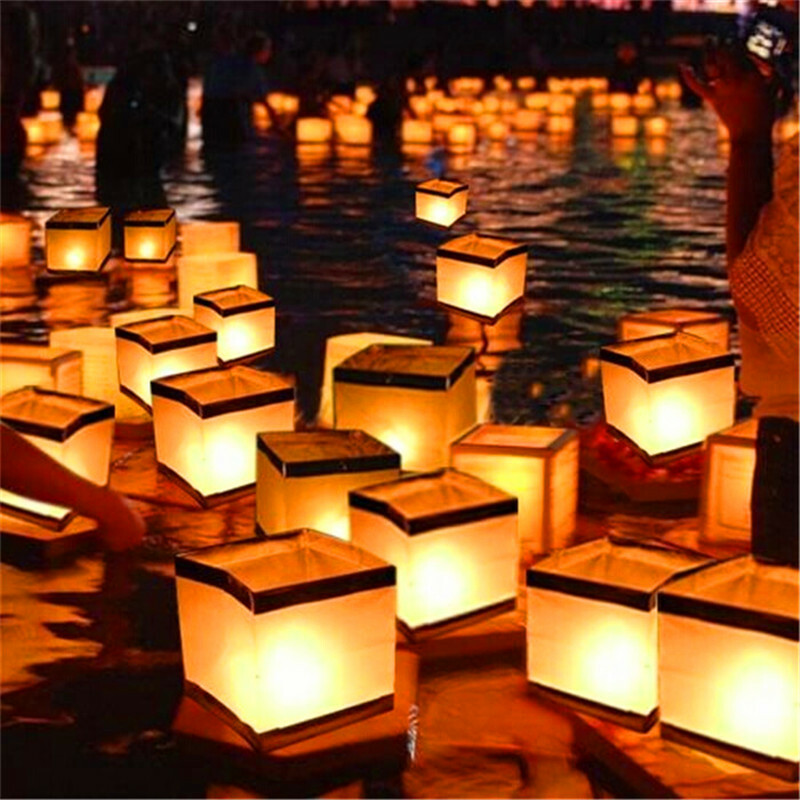 The pond was surrounded by a path of shells and several garden lanterns. It was a wonderful, peaceful, place to be. I enjoyed the beauty and the sound of water falling made the silence stronger and deeper. It was ... like the pure land. I felt the presence of my father's spirit. "This garden is wonderful", I whispered. "I know my brother. I am visiting this garden regularly, because it feels like a place in honor of father", Kichirou said. I could hear the tears in his voice and my heart opened up to him. He had loved father and he had the same experiences as I had. The same memories. I kissed him on his forehead. "I am glad that I have found you". Later that afternoon Kikaku brought me to the master. Kichirou was invited too, but he decided not to come with us. "It's your wish Yozakura to meet Basho. You came back for him. So I will not spoil your moment with him". It made me a bit sad, but I understood why Kichirou wouldn't come. He granted me this special moment, because he loved me and he knew how much I wished to meet Basho. I hugged him. "Thank you my brother. I love you". A little later Kikaku and I arrived at the "Basho hut". 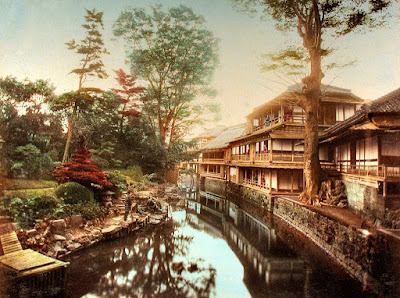 It was really just a hut, but it was surrounded by a garden in which the Basho tree he got from Rika, one of his apprentices, was obvious present. Next to that tree the garden was planted with Cherry trees, Jasmine and Snowball. At the back of the "Basho hut" the Wisteria was in full bloom. In the garden, under a cherry tree, I saw a small group of people, male and female, sit on the grass. They all listened to a young handsome man who was telling them about the beauty of nature and how to become one with nature. "That must be him", I thought. "He looks so small, but in a way he is bigger than all others". Kikaku coughed to get Basho's attention. Basho looked at him and smiled. He got on his feet and walked towards us. He embraced Kikaku and gave him a kiss on his forehead. "It is good to see you Kikaku". Than he saw me. "And whom is this good looking young man?" He asked. 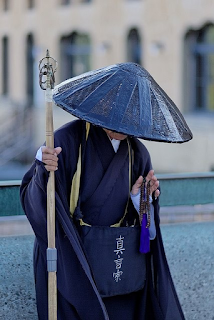 "This my friend is Yozakura he is a young haiku poet who wanted to meet you". Basho bowed. "Welcome Yozakura. Welcome in my garden. My name is Basho". He took my hand. "Come Yozakura let me introduce you to the others gathered here". The others were already on their feet too as we walked towards them. I saw a nice group of people all with their own characteristics. All happy and smiling. Basho introduced me to them one by one. Than we sat down together. "Tell us something about yourself Yozakura", Basho said. I told them the story of my life and how I had heard about Basho, than known as Tosei. "I was anxious to get to know you Basho. I had heard a lot of stories along the roads about you. You are the reason why I started to write haiku". "Did you write haiku while on your way?" Ransetsu, one of Basho's apprentices, asked. I nodded. "Please can you declaim a few of your haiku for us?" I became nervous and I felt that I blushed. "Don't be shy Yozakura", Kikaku said. "Your haiku are excellent". Basho encouraged me too. "Please Yozakura". I grabbed my rice-paper booklet from my knapsack. "These are just pieces I wrote that look like haiku, but they were written from the heart. As I told you my life wasn't easy and that made my heart cry". "That, Yozakura, is the only way to write haiku. Right from the heart", Basho said. His disciples agreed. I looked around and waited. They applauded. "Wonderfully crafted haiku Yozakura", Basho said. "But that last one can be so much stronger. Allow me to redo it?" "Yes please", I answered. "I love to learn from you". Basho took a piece of rice-paper and after a while he calligraphed his interpretation of the haiku I just had declaimed. He gave this haiku to me. "Thank you", I stammered. "I will keep this close to my heart in memory of today. The day I met you ... my sensei". I hope you have had a wonderful weekend. I can honestly say I had. After a very busy week at work I was glad to have the weekend off. However I was busy too in this weekend, because I am preparing our fifth anniversary next month. I hope that this first CDHK lustrum will be awesome. Of course I will try to make it a very festive month and I think I have succeeded. This month it's all about Imagination Without Limits and for today's CD Imagination I have a wonderful image for you. I have found this image on Tumblr, but I couldn't retrieve the owner of it. So if you are the owner, or you know who the owner is, please let met know. This CD Imagination is open for your submissions tonight at 7:00 PM (CET) and will remain open until September 24th at noon (CET). I will try to publish our new episode later on. You can find a preview at our CDHK Tumblr. I traveled on with joy in my heart. 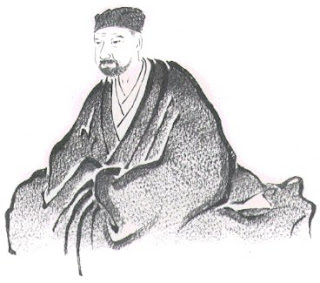 Finally I would be meeting this Tosei, now known as Basho, after that seemingly not beautiful banana-tree with its tiny vague yellow blossoms and its useless wood. 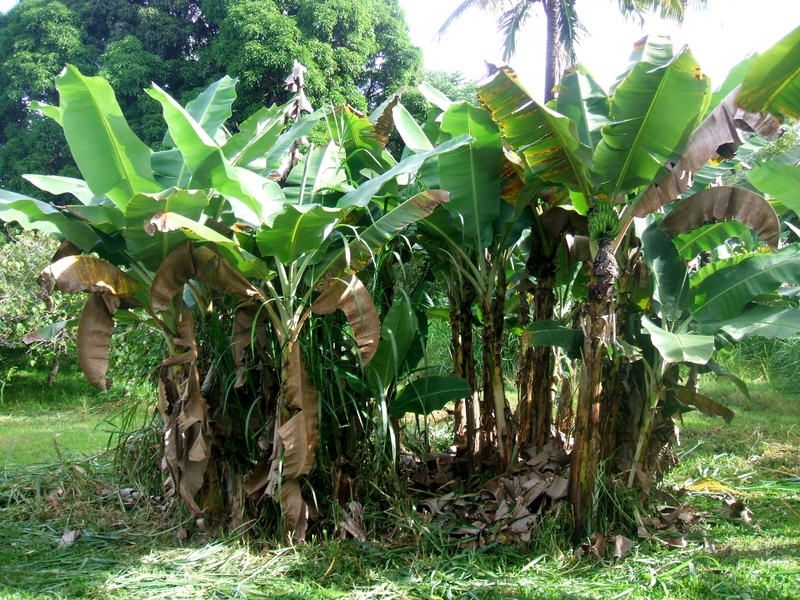 This banana-tree is beautiful through its ugliness and uselessness. While I was on my way back home to Edo I contemplated about that banana-tree asking myself "why this famous poet had chosen this pseudonym. After a few days I almost was at Edo. I sat down next to the road I was walking and looked at Edo. 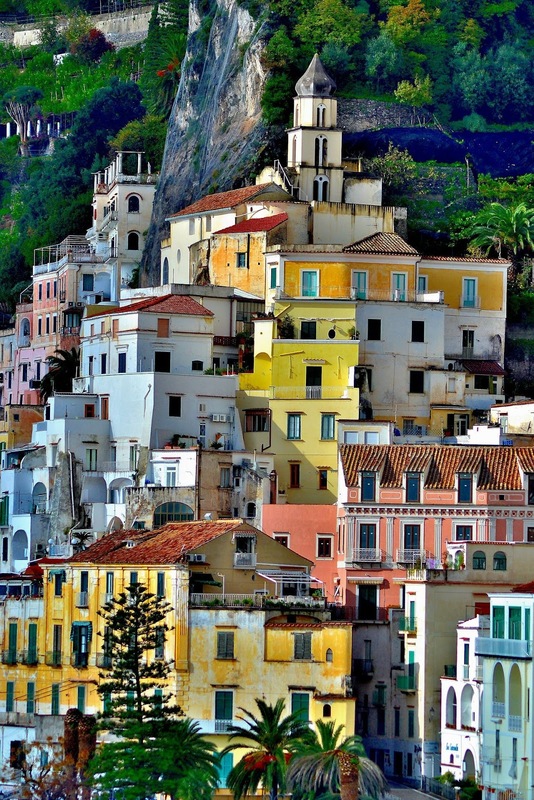 The town was rebuild and looked even more beautiful then it ever was. I saw the people, children playing and every were I looked I only saw happiness. As I sat there my mind went on a roll. Thoughts of my happy childhood and the sadness of losing both my parents fought for my attention. 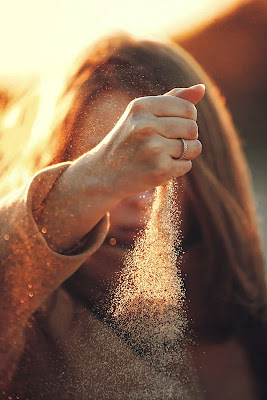 While I let go my thoughts and memories, tears covered my cheeks. "I still miss you both", I whispered. I sat there for a few hours and when the shadows became longer and the sky started to change into the beauty of the sunset I walked into the city. Edo my home-town. I found a small lodging house in the suburb of Edo named "Fuji no Hana", Wisteria flowers, and rented a room for a few days. It was a nice, not very expensive, lodging house and the owner was a beautiful former geisha with a bright smile, named Shiori, "poem". She was a great host and she wrote haiku also. After a good meal I decided to go to sleep. I said goodnight to my host and went to my room. I was exhausted, but couldn't find sleep. I turned and turned on my sleeping mat, but the sleep wouldn't come. After a while I went downstairs to the dinner of the lodging house. All guests were already at sleep and only the host, Shiori, was still there. She sat at one of the tables with a booklet of paper that was still virgin white. I coughed to get her attention. She looked up from the virgin paper. "Couldn't sleep", I said. "Can I sit with you?" She nodded. "Tell me something about your wanderings", she said. "For starters ... what's your name?" "My name is Yozakura", I answered. She smiled. "I once knew a young guy named Yozakura", she said. "He was the son of a grocer". She looked closer to me. "You look somewhat like him". "Would you like to tell me a little bit more about him?" I asked.
" His mother died when she was giving birth to him. I remember that his father wasn't loving him, but that was more a reaction, I think, on the fact that his wife died during labor". Tears rolled down my cheeks. Shiori, in shock, looked at me as she saw me crying.
" I am that Yozakura you are telling about. My mother died in labor and my father was angry about that. As I became five years he decided to send me away to the shogun to get educated. After several years I returned to Edo and my father. He forgave me and asked my forgiveness for all he had said and done. We became closer then we ever had been. I lost him in the Fire of Meireki". My tears rolled freely now. Shiori laid an arm around me and kissed me on my forehead. "Yozakura you are a righteous man and you needed this. You never mourned about them, maybe you fled for the thoughts and memories of them, but this ... death belongs to life, without that knowledge your life will never be complete. Come on let me help you to your room". I awoke around noon and right then Shiori knocked on the door and entered my room. "Did you sleep well Yozakura?" " Yes, thank you. Thank you for all you have done". Shiori smiled. "It's okay. Come go wash yourself and have lunch with me", she laughed. Her laugh sounded like a crystal brook and touched me. For the first time I felt something I never had experienced in my life. I knew right than ... I was in love. After a few days at the Wisteria flowers lodging house I went into Edo on my way to meet my soon to be haiku master Basho, but before that I visited my mother's garden. As I was sitting in front of her grave stone a young handsome guy walked into my mother's garden. In a way I felt a connection with him. He looked at me and smiled. "Finally I meet you Yozakura, son of Kyoshi and Fujiko, my brother".
" I am your brother Yozakura. After your father send you away he and my mother became acquainted and married soon after. My mother, Sachiko, happy child, died shortly after I was born. Father send me to my grandmother. He couldn't handle the situation, because of your mother, who died during labor of you'. I saw tears on his face and I saw similarities in his features with my father. "My brother ... I know what you are feeling right now. I felt the same. Please don't cry or let us cry together. What's your name ... my brother?" " My name is Kichirou (lucky son)", he whispered.
" Where do you live?" " Just around the corner of this memorial garden for both our mothers. My mother also was buried here by father". He took my hand. "Let me show you her grave". 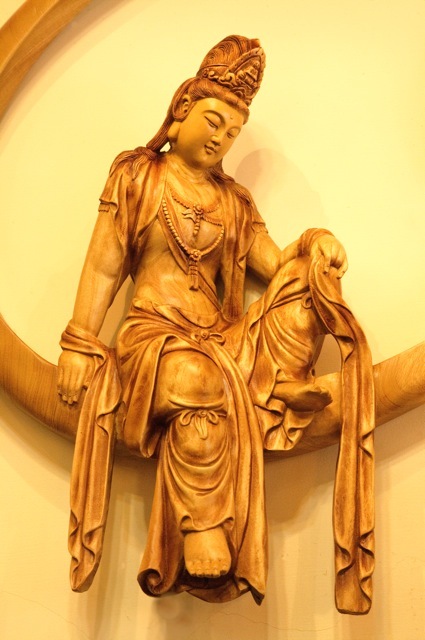 Not far of my mother's grave I saw another marble stone, surrounded by Jasmine.
" This is my mother's grave". Kichirou said. "He planted Jasmine in her honor. She loved the sweet perfume of Jasmine". A little later Kichirou invited me to his home. It was a small, but cozy, home and it felt awesome. 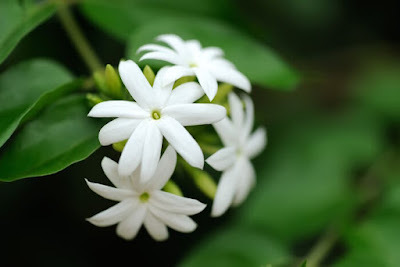 I smelled the sweet perfume of Jasmine and saw a small garden behind his home in which the Jasmine was in full bloom. We walked into the garden and sat down on the cushions on the small wooden veranda. Kichirou presented me Jasmine tea. In silence we drank our tea. The sweet perfume of the Jasmine seems to become stronger and not a minute later it started to rain softly. "Why have you come to Edo?" Kichirou asked me. I looked at him.
" I am hoping to become an apprentice of Basho, a famous haiku poet from Edo. Maybe you have heard of him".
" Yes I have heard of him. Recently he settled down in a small hut along the river. One of his apprentices gave him a Basho-tree and his hut is now called the "Basho hut" and he, Tosei, changed his name into Basho. I have visited him once. He is a handsome guy, not extraordinary beautiful, but handsome. He has a very loving character and his apprentices adore him. A friend of mine, Kikaku, is an apprentice of him, a very close relation they have. There is a rumor that they are not only friends, but also lovers. Basho is openly about his preference for guys, but as far as I know he and Kikaku don't have a relationship. They are just close friends". "I would love to meet your friend Kikaku. Can you introduce me to him?" Kichirou nodded. "I will introduce him to you tomorrow if that's okay with you?" " Sure that's okay. Do you write haiku?" " No I have tried it but it's to difficult for me. And you? Do you write haiku? " " In fact I do, but they aren't really good in my opinion. Friends however say that my haiku are really beautiful and the encouraged me to go on and make them even more beautiful. That's the reason why I love to meet Basho. I hope he will be my sensei, my master, to help me to improve my haiku writing skills".
" Do you have a few examples of haiku you have written?" " Can I read them?" " Yes of course". I picked up my knapsack and gave him a booklet of rice-paper on which I had calligraphed my haiku.
" Wow ... these are real beauties. For sure I know that Basho will take you as his apprentice". I blushed. "Thank you Kichirou". I gave him a kiss on his forehead. "My brother ... I love you".
" I love you too Yozakura. I am glad to have found you my brother. Let us celebrate that. Do you drink sake?" " Yes I do, but I do like it cold". Kichirou came back to the veranda with a bamboo tray on which he presented sake in a wonderful earthenware jar and two earthenware bowls. I remembered them. 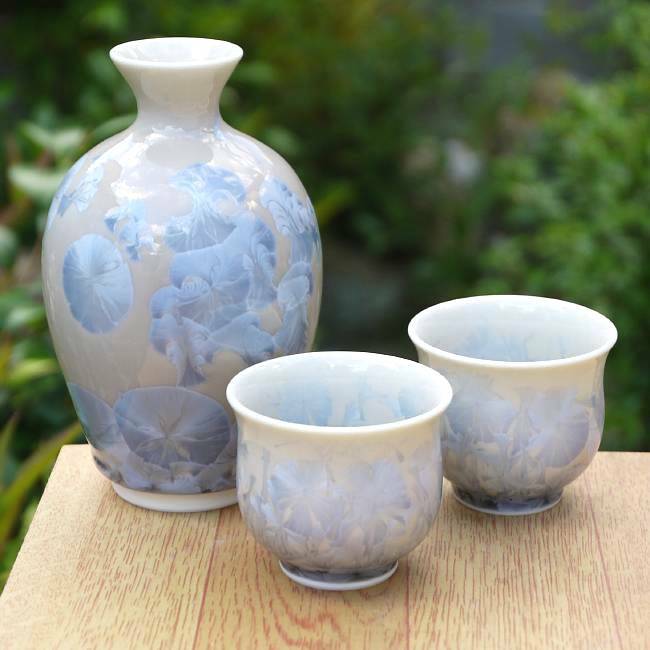 This sake set was decorated with Wisteria blossom and I knew that they once were in the possession of my father.
" This set I know", I whispered. " Father has made it". Kichirou nodded. "I got them as a gift from father. He said "One day you and your brother Yozakura will meet. Please save them for that day". Well ... that day has come today. So let us drink to the health of our parents, and to the health of you and me. Finally we have found each other". 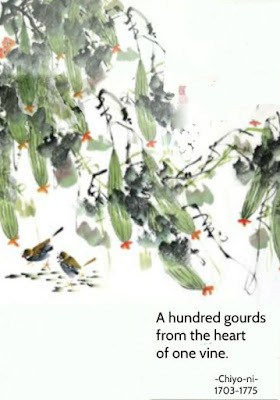 Carpe Diem Weekend-Meditation #2 Troiku "a hundred gourds"
!! Open for your submissions next Sunday September 17th around 7:00 PM (CET) !! Welcome at a new episode of our "weekend-meditation" with a new logo as you can see. I was busy creating it last weekend, so it wasn't possible to use it then. 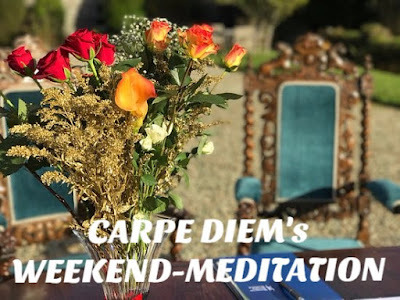 As you maybe have read in the menu above or have read in one of the earlier posts this month I have chosen new kinds of "weekend-meditations. Last weekend I challenged you to create "squared Tan Renga", and I have read wonderful submissions. As you maybe know I have invented several new ways of being creative with haiku for example the Troiku and the Soliloque No Renga. Both are wonderful ways to be creative with haiku and gives you the opportunity to "think out of the box". This "weekend-meditation" I love to challenge you to create a (or more) Troiku. More about Troiku you can find above in the menu. Not only an explanation of the Troiku you can find in the menu, but also an exclusive CDHK e-book "Flamingo Clouds". Both are great to read and both give you an idea of what Troiku is (or can be). For this "weekend-meditation" I love to challenge you to create a Troiku based on a classical haiku by Chiyo-Ni (1703-1775) one of the five famous haiku poets. Chiyo-Ni was the first female haiku poet / master and was a disciple of the Way of Basho. She never knew him in life, but she admired him and wrote in his spirit. For this Troiku I have chosen a not so well known haiku written by Chiyo-Ni to start the Troiku with. This haiku she wrote at the age of 6 years, and it is a real beauty ... in which we already can see (and read) her high standard of writing haiku. Or ... as a kind of connection with our theme "Imagination Without Limits", you may also use the following haiku for your Troiku. Enough to work with this weekend I would say. Have a great weekend! This weekend-meditation is open for your submissions next Sunday September 17th around 7:00 PM (CET) and will remain open until September 24th at noon (CET). This month it's all about Imagination Without Limits. Through only images we try to create Japanese poetry. And today I have a beautiful image (taken by myself) of the City Park just around the corner of my home. I remember that I used this image once for a haiga which I published on Wonder Haiku Worlds, I am a long time member of this website and back in 2011 there were 11 haiku/senryu created by me part of a world wide Anthology "Spasms Of Light". 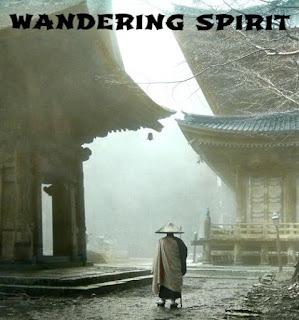 Wonder Haiku Worlds is in my opinion a nice website to find several haiku, senryu, tanka and lots of other Japanese poetry forms. For sure worth to visit. A "wink" towards that famous haiku by Basho, which we have seen here at CDHK very often. This episode is open for your submissions tonight at 7:00 PM (CET) and will remain open until September 20th at noon (CET). I will try to publish our new episode, a new weekend-meditation, later on today. A preview of our next CD Imagination you can find at our CDHK Tumblr. Welcome at a new episode of "Imagination Without Limits", the theme for this month's CDHK. 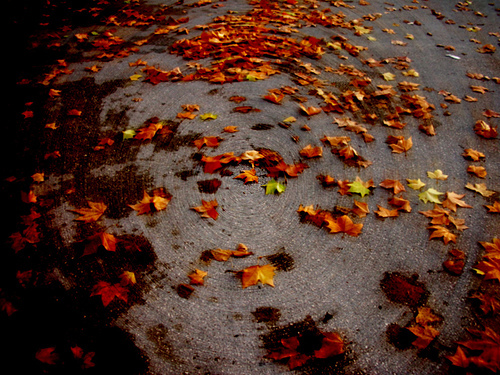 We have had already beautiful images that "triggered" you all to create wonderful poetry. Of course that's the goal and that's the same goal for today's CD Imagination. 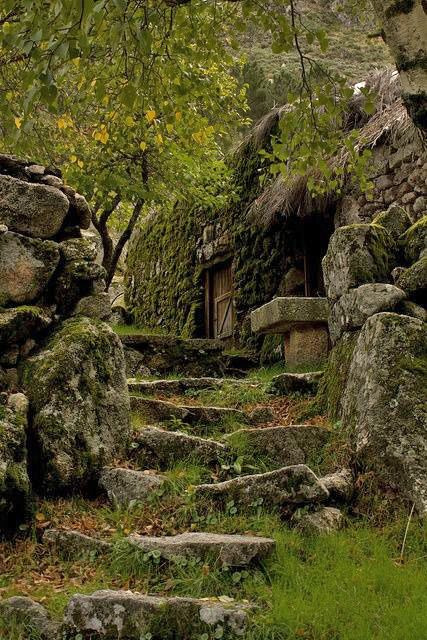 This time I have a wonderful image for you which is taken somewhere in Portugal. It's a really nice image and I hope it will inspire you to create (again) nice poems. This image is taken by someone named Jan, but I couldn't retrieve him (or the owner of the photo). So if you are the owner of the photo or you know who the owner is, please let me know. 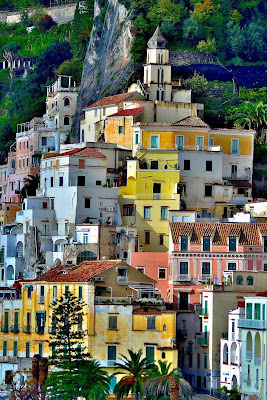 By the way this photo I found on the Tumblr titled "bonitavista", for sure worth a visit. Maybe you have noticed that I am trying new ways to create haiku, I call it "experimental" haiku. I love to experiment with our beloved haiku ... it triggers me to use a minimum of words to sketch a scene. The above "experiment" looks in my opinion awesome, but what do you think of it? This episode is open for your submissions tonight at 7:00 PM (CET) and will remain open until September 19th at noon (CET). I will try to publish our new episode later on. A preview of the next CD Imagination you can find at our CDHK Tumblr. Wow what an awesome response I have gotten on one of the earlier posts here in which I told you about the start of Carpe Diem back in 2012. It is really awesome to see how many haiku poets have found their way to Carpe Diem. It is really a joy and an ecouragement to go on and create Carpe Diem Haiku Kai for you all. Today I have another beautiful image for you. This one I found on Tumblr's "AvaZenGarden" and I couldn't find the name of the photographer. With this image came a quote by Buddha, which I will share also here, but first the new CD Imagination. As I read this quote at "AvaZenGarden" I remembered that I had used this quote earlier here at CDHK (back in 2014) and immediately there came a few haiku in mind which fits this image like a glove. I hope you did like this new CD Imagination episode and I am looking forward to all your responses on this CD Imagination. This episode is open for your submissions tonight at 7:00 PM (CET) and will remain open until September 18th at noon (CET). I will try to publish our new CD Imagination later on. You can find a preview already at our CDHK Tumblr. Have fun! I hope you all have had a wonderful weekend and I hope that I challenged you, but not to much, with this Squared Tan Renga. I know it wasn't an easy task, but I am looking forward to all of your responses. 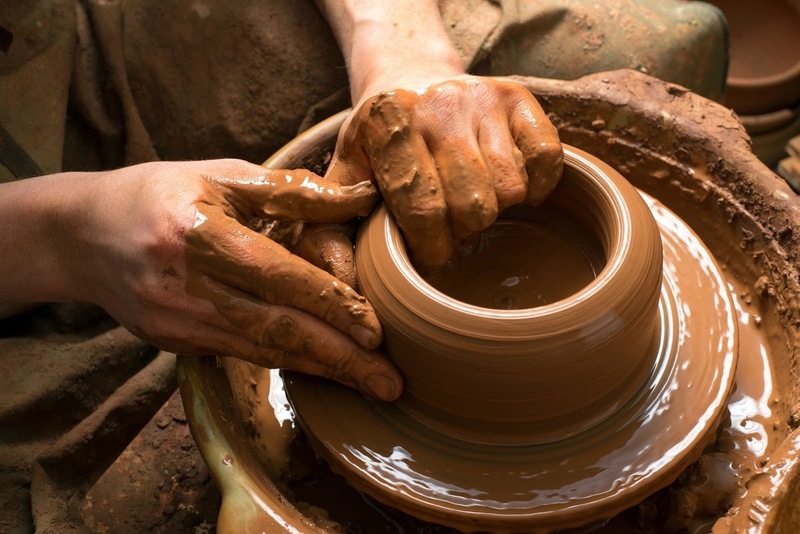 This month we are exploring the "limits of imagination", or better said "without limits" and today I have another wonderful CD Imagination for you. This time I have chosen a photo by Jackie Ley titled New Forest. This photo I also found on Tumblr, a great source of inspiration. 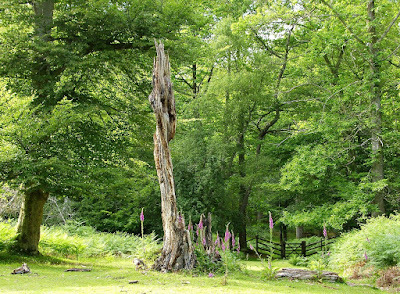 I think this episode, New Forest, will be a joy for one of our long term members, Hamish Managua Gunn, but of course I hope that you all will enjoy this episode. I found this beautiful photo on the Tumblr of The Woodland Trust, a British organisation that protects 35 Ancient Woods. Their Tumblr is really awesome. Well ... I hope you all did like this new CD Imagination. You can find a preview of our next CD Imagination on our CDHK Tumblr. This episode is open for your submissions tonight at 7:00 PM (CET) and will remain open until September 17th at noon (CET). I will try to publish our next episode later on. I said my goodbyes to Yori and Yamato and promised them to come back. They had taken care of me and we were friends forever. Yori and Yamato walked with me to the outside of the village, there were the country side started. We embraced each other. "Friends forever, we will see each other again somewhere on the path of life", said Yori. I felt his tears on my cheeks. 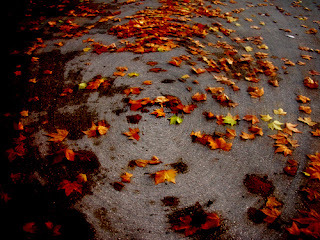 His tears mingled with mine and felt like drops of rain on the sandy road and became one with the earth. Yamato's tears followed. Than I took the road not looking back. I waved without watching. Alone again but with a heart full of love. "We will meet again my friends", I whispered. I was on my way, clothed like a monk walking barefooted my staff in hand, to Kobe, to become a monk of the Taisan Ji Temple as was my former goal before I met Yori and Yamato in their lodging house. My journey brought me and my once to become haikai master Tosei closer to each other. At the end of the day I found an old shed were I could spent the night. In the back of the shed I found a well and the bucket to pull up the water was still there. I unclothed and washed my body. The cold water felt great on my naked body. I felt free and right at that moment I saw a shooting star. I whispered a wish. A smile on my face. After a hot cup of soup and a black piece of bread I sat down on my sleeping mat. Through the torn apart paper window I saw the moon. I heard the voices of nature, the wind , the rustling of the leaves and ... there it was the fragile and beautiful song of a Nightingale. It comforted me, but it made me also a bit melancholic. After a while I decided to go to sleep. I dreamed about my mom and dad. They hugged me. "You will become a great poet my son", my mom said and my dad nodded. "Follow your dream Yozakura", he said. Than, after my parents vanished in a wonderfull light, I saw Hoshina. He smiled at me and kissed me. In an eye-blink we laid on a bed of roses and made love. I felt tears as he disappeared. "I will always love you Yozakura. Follow your dream become like Tosei ... now called Basho". Than I saw a small hut surrounded by Basho trees, banana trees and a young, gorgeous, man. He smiled at me: "You will find me Yozakura, but you have to return to Edo". With a shock I woke up. "What .. what ..."
As I recovered from the shock I saw that the sun was already high up in the sky. "How long did I sleep?" I thought. I washed myself and picked up my belongings and took the road. The dream I had played again and again in my head. I cherised this dream and will never forget it. "I have to back to Edo", I whispered. Carpe Diem's Road to Yesterday Celebrating Five Years of Japanese Poetry #1 Introduction "right from the heart"
Let us take a trip back in time, back to September 2012, especially September 17th 2012. 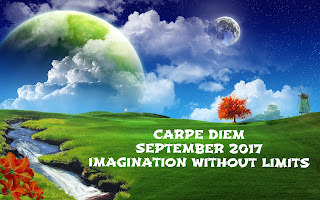 On that day I put Carpe Diem online with a kind of introductory, welcoming episode, for a new daily haiku meme inspired on a few other daily haiku memes in which I participated. This is my new weblog. 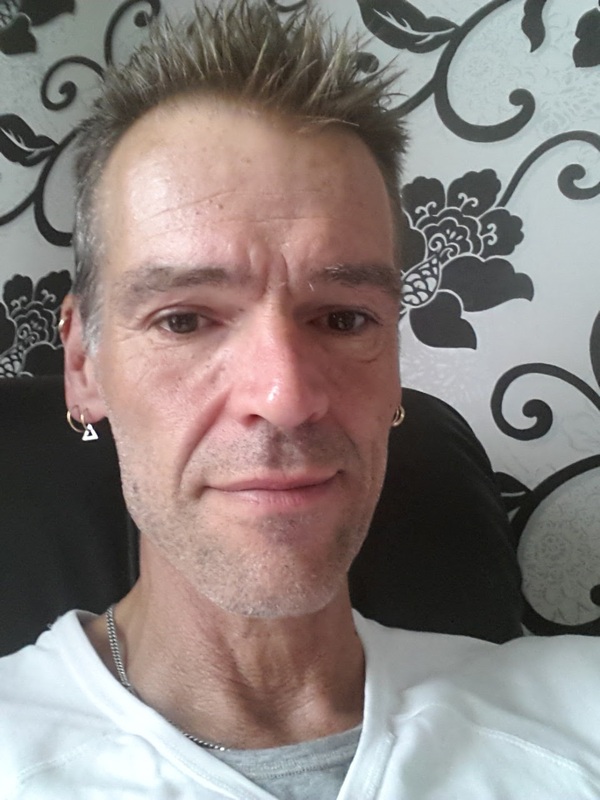 I am Chèvrefeuille a Dutch haiku poet. I love to start a new daily meme for haiku poets. This weblog is the base for that haiku meme. I hope to see a lot of visitors to enjoy the fun of writing haiku, a classical Japanese poem, on a theme given every day. As I look back to that time of preparations for the first ever prompt at Carpe Diem I smile. What nervous I was if it would work, if I could make it happen ... a daily haiku meme ... I was excited as I started, but also anxious ... because it had took me a lot of time and I just hoped it would work, it would become a success ... At that time I thought: "I just will give it a try, maybe it will last only for a few months, but than I have tried it". At that time I really hadn't thought that Carpe Diem would still exist several years later, yes of course I hoped it would be a success ... but there was at first the language. I had chosen to use English, but that's not my maiden language and at that time I didn't wrote a lot in English, but ... during the years I think my English has become better, at least good enough to write the blogs / episodes. When the preparations were ready I finally could publish the first episode, Waterfall, that was on September 21st 2012, but the submissions started on October 1st 2012. For starters ... I will give the first prompt for this new daily haiku meme today. So you can think about it and be inspired. Carpe Diem is a new daily haiku meme in which you can share your haiku. The haiku (or senryu) can be a classical or a non-classical one. It's all up to you. The first prompt for CARPE DIEM is waterfall. I think this is a great prompt to start with. Let flow your inspiration like a waterfall and share your haiku with us. Please be so kind to share a thought in the comment form. Do you have an idea for a new prompt? Well ... share it with us. I look forward to your contributions for this new haiku meme. And I hope it will be a success. I will try this to the end of the year ... so I hope that I can continue this haiku meme in January 2013. And so it started ... Carpe Diem, a daily haiku-meme. Back than the most episodes were short, mostly because of the fact that my English wasn't good enough, but also because of me being nervous if this project would succeed. 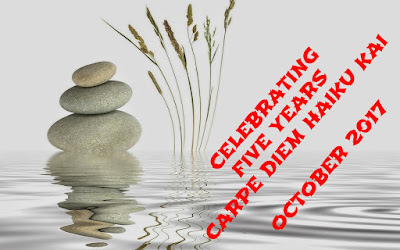 Well ... next month we will celebrating our fifth anniversary ... and I really hadn't thought that Carpe Diem, nowadays called Carpe Diem Haiku Kai, would be still alive and kicking. CDHK has grown, we are a real family of haiku loving poets, and there are more parts of CDHK and of course there was the wonderful cooperation with Jane Reichhold. She inspired me to go on and was also the one who gave me the inspiration, the idea, to create exclusive CDHK e-books. Five years after the start of Carpe Diem ... a good reason to celebrate and I have to thank you all, my dear Haijin, visitors and travelers ... you all are my inspiration, my source, my engine to go on with Carpe Diem Haiku Kai. I am looking forward to our fifth anniversary next month and I hope you all do too, because we make Carpe Diem Haiku Kai together.